I had a lot of fun making this birthday card for my father-in-law. It is also one of the first masculine birthday cards I have made!. I used Night of Navy and Crumb Cake cardstock to make this card. I love how the colours work together. 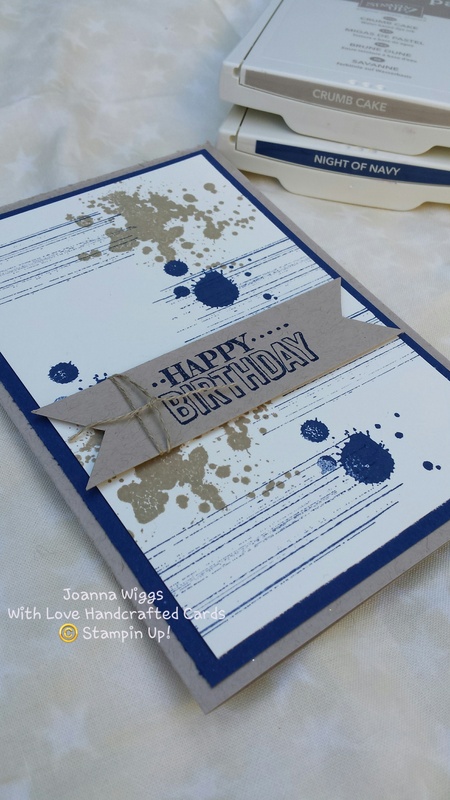 I also used one of my favourite stamp sets ‘Gorgeous Grunge’ to make the splotches in the background. Stamp a Happy Birthday onto a banner. Add some linen thread. Pop it up on dimensionals and it is done! This card took me no time to put together. Quick, simple and effective! Lovely! Masculine cards can sometimes be so hard, but navy and beige is a great colour scheme for them.